Allison Williams is director of music, organist, and director of the youth choirs at Bethany Lutheran Church in Crystal Lake, IL. She also teaches vocal music at Lundahl Middle School in Crystal Lake. Allison holds the Bachelor of Science degree in music education from Concordia College in Bronxville, New York, the Master of music degree in music education from the Catholic University of America, Washington, D.C. and the Performer’s Certificate from Northern Illinois University. Her teachers have included Richard Hoskins, Dr. David Schrader, Dr. H. Ricardo Ramirez, James Russell Brown, Colin Andrews, and piano study with Dr. Raymond Jackson. 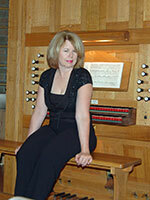 Allison is a colleague of the American Guild of Organists (CAGO) and the secretary of the Chicago Chapter.